The Peace silver dollar was issued from December 1921 through 1935. Both the obverse and the reverse were designed by Anthony de Francisci who won a competition sponsored by the Federal Commission of Fine Arts. Lady Liberty portrayed on the obverse was modeled by his 23-year-old wife Teresa Cafarelli. The Pittman Act of 1918 dictated that the United States Treasury strike millions of silver dollars. However, the new Peace dollar design was not ready for production and Morgan dollars were minted instead. The first Peace silver dollars produced in 1921 were struck in high relief. This caused a lack of detail in the center of the coins where the relief is the highest. In order to get them to strike up properly, the coins had a be struck with increased pressure. This shortened the production die life and increased productions cost. In 1922 the relief was lowered and this yielded better-struck coins and increased die life. The coins were continuously struck through 1928 and then again in 1934 and 1935. Peace silver dollars are a popular coin to collect amongst intermediate level coin collectors. However, beginning coin collectors can start to assemble their collection of lower grade Peace silver dollars. The value of Peace silver dollars is definitely influenced by the grade of the coin. Obverse Description Liberty, facing left, wearing a diadem of spikes. LIBERTY is above, while IN GOD WE TRUST and the date are below. Reverse Description Eagle perched on a rock, with a laurel branch, and with PEACE inscribed below. UNITED STATES OF AMERICA and E PLURIBUS UNUM are above, ONE DOLLAR is in the center. Rays of sun from below the horizon emanate from the lower right. Notes 1921 issues have a higher relief than subsequent issues. The Peace silver dollars were minted from 1921 until 1935. However, Peace dollars were not produced in every year as indicated in the table below. 1922 High Rel. Philadelphia Most, if not all, melted at the Mint. 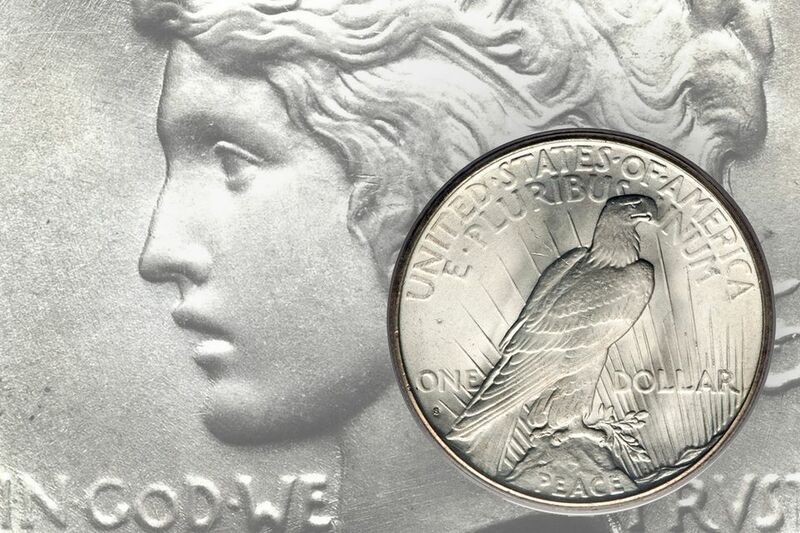 Coin collectors look for the following popular Peace silver dollar errors and varieties. These coins usually carry a premium and are valued above a common coin. Intermediate coin collectors will learn to recognize these key dates, rarities, and varieties for the Peace silver dollar. 1935 San Francisco S 4 Rays 4 rays below "ONE"
Peace silver dollars were minted at three different United States Mint facilities: Philadelphia, Denver, and San Francisco. Production quantities varied across the different mints, however, where possible production numbers by strike type are noted. 1922 Philadelphia 35,401 Most, if not all, melted at the mint.